Most VPN service providers target the individual consumers for personal, non-commercial use. PureVPN, a Hong Kong-registered company, offers its VPN services to both individuals and businesses. 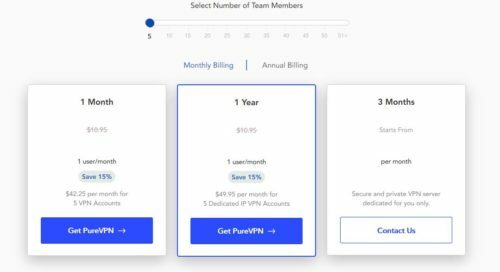 Individual consumers can subscribe to a 2-year VPN plan for $3.29 (USD) per month. The price is among the lowest in the industry. This plan allows up to 5 devices to access the Internet. You can connect your PCs as well as your smartphones using this plan. Many PureVPN competitors only allow a maximum of 2 or 3 devices. Be mindful, however, of the relatively short 7-day money-back guarantee. If you want to test it before committing to a longer term, you can subscribe to the 3-day trial account for $2.50. When you buy on their website, you have many payment options. To best protect your anonymity, you can pay with Bitcoin or a supported gift card. If a smartphone is your only device for VPN connection, you should consider the mobile-only plan which costs $4.99 per month. There is no multi-login for this plan: you are licensed for one and only one mobile device. Please click here for the differences between the full-featured and the mobile-only plans. To access the VPN, you need to first download the PureVPN app for your Android or iOS phone from its respective app store. Initially, this app is free but also crippled. Specifically, you are limited to 2 gigabytes of data, and you can only connect to VPN servers located in a handful of countries. To unlock the full feature set, you can use the in-app upgrade to purchase the mobile plan. If you represent a company with 5 or more employees, you may want to consider their business VPN plans. A dedicated IP is a user-selected static IP address which is geo-located in 1 of 8 countries. Each dedicated IP can only be assigned to a single fixed device for connecting to the Internet. With a business account, you can manage all the children VPN accounts using a unified management portal. Also, these VPN accounts have access to special high-speed business-only servers. – Network Address Translation (NAT) firewall. PureVPN operates its own tier-1 VPN network. Essentially, devices connected to its network have a more direct route to the Internet backbone, and hence enjoy greater speed than a tier-2 or 3 network. The PureVPN network consists of 500+ servers in 141 countries. A direct benefit is that people from one country can connect to a VPN server located in another country in the network, and watch online sports programs that are otherwise restricted to local viewers. For instance, an American can connect to a UK-based VPN server and watch English Premier League games on a UK website. The second benefit applies when you are traveling in a foreign country. While there, you can connect to the VPN for better protection of your online privacy. Be forewarned that if you are connecting from a foreign country, PureVPN needs to explicitly grant you access to the VPN network. Essentially, it means that you must inform PureVPN of your travel plans. This practice is rather unique in the VPN market, and is a source of major inconvenience for frequent travelers. The third benefit is that PureVPN does not limit bandwidth or data usage per user. However, its terms of service document refers to limits based on ‘fair usage’. Violating fair usage may result in account suspension or termination. What constitutes unfair usage? According to the terms of service, it is unfair if you are using “excessive bandwidth that exceeds the average user bandwidth” for an extended time period. Very vague, indeed. This review was written after filtering the information from the PureVPN website followed by 2 chat inquiries to PureVPN support. The support inquiries were necessary because the website either did not contain the basic information or was ambiguous. PureVPN prices are among the lowest in the industry. Many subscription choices: 3-day paid trial, mobile use only, and bundled business accounts. VPN servers are deployed in 140+ countries. Dedicated IP and other add-ons are available. Bitcoin, PayPal, and gift card payments are accepted. A major inconvenience if you are a frequent foreign traveler. Difficult to find complete information on the website.